Effective doctor-patient communication is a central clinical function in building a therapeutic doctor-patient relationship, which is the heart and art of medicine. This is important in the delivery of high-quality health care. Much patient dissatisfaction and many complaints are due to breakdown in the doctor-patient relationship. However, many doctors tend to overestimate their ability in communication. Over the years, much has been published in the literature on this important topic. We review the literature on doctor-patient communication. Today, patients have recognized that they are not passive recipients and are able to resist the power and expert authority that society grants doctors.35 They can implicitly and explicitly resist the monologue of information transfer from doctors by actively reconstructing expert information to assert their own perspectives, integrate with their knowledge of their own bodies and experiences, as well as the social realities of their lives.35 Being attentive to social relationships and contexts will ensure that this information is received, and most importantly, acted on.35 Lee and Garvin35 asserted that inequality, social relations, and structural constraints may be the most influential factors in health care. 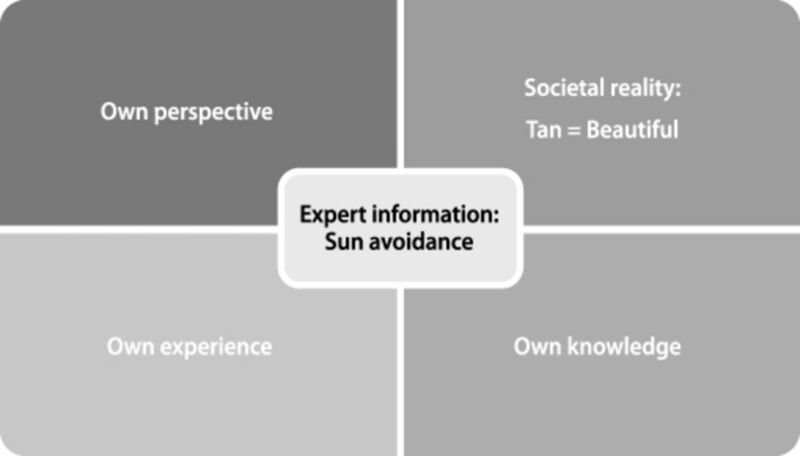 This was illustrated in their study when female patients from a lower socioeconomic demographic in the Appalachian region of the United States modified advice to avoid sun exposure and, by taking into account societal pressures that equated tanned skin with beauty, continued tanning despite knowledge of the risks associated with sun exposure and skin cancer (Figure). The study by Lee and Garvin35 demonstrates the need to take into account social factors in the production, dissemination, and use of knowledge. Example of influences that a patient takes into account on the doctor's advice. Baile et al12 reported that patients often regard their doctors as one of their most important sources of psychological support. Empathy is one of the most powerful ways of providing this support to reduce patients' feelings of isolation and validating their feelings or thoughts as normal and to be expected. Clinical research will guide improvements in determining best practice. Randomized controlled trials are able to effectively control bias and chance in evaluating efficacy. However, this is easier said than done in terms of investigations of communication. A majority of the studies reported in this review were cross-sectional.7 However, doctor-patient relationships are frequently long term, involving multiple visits, and this may limit the generalizability of the studies. (1981) Communication of affect between patient and physician. J Health Soc Behav 22((1)):18–30, pmid:7240703. (2004) Assessing competence in communication and interpersonal skills: the Kalamazoo II report. Acad Med 79((6)):495–507, pmid:15165967. (2007) Assessing the communication and interpersonal skills of graduates of international medical schools as part of the United States Medical Licensing Exam (USMLE) Step 2 Clinical Skills (CS) Exam. Acad Med 82((10 Suppl)):S65–S68, pmid:17895694. (2005) Doctor-patient communication and satisfaction with care in oncology. Curr Opin Oncol 17((14)):351–354, pmid:15933466. (2007) Effect of multisource feedback on resident communication skills and professionalism: a randomized controlled trial. Arch Pediatr Adolesc 161((1)):44–49. (2002) Continuing concerns, new challenges, and next steps in physician-patient communication. J Bone Joint Surg Am 84-A((2)):309–315, pmid:11861738. (2003) Interacting with cancer patients: the significance of physicians' communication behavior. Soc Sci Med 57((5)):791–806, pmid:12850107. (1995) Effective physician-patient communication and health outcomes: a review. CMAJ 152((9)):1423–1433, pmid:7728691. (2005) Communication skills for patient-centered care: research-based, easily learned techniques for medical interviews that benefit orthopaedic surgeons and their patients. J Bone Joint Surg Am 87:652–658. (2000) The impact of patient-centered care on outcomes. J Fam Pract 49((9)):796–804, pmid:11032203. (2002) Enhancing physician-patient communication. Hematology Am Soc Hematol Educ Program 1:464–483, pmid:12446437. (2000) SPIKES—a six-step protocol for delivering bad news: application to the patient with cancer. Oncologist 5((4)):302–311, pmid:10964998. (2003) Sticky issue of adherence. J Paediatr Child Health 39((1)):2–5, pmid:12542804. (2005) A quantitative analysis of anaesthetist-patient communication during the pre-operative visit. Anaesthesia 60((1)):53–59, pmid:15601273. (2006) Assessing surgeons' disclosure of risk information before carotid endarterectomy. ANZ J Surg 76((7)):618–624, pmid:16813629. (1983) Physician/patient communication: transmission of information and patient effects. Md State Med J 32((4)):260–265, pmid:6865482. (2007) Differences in physician and patient perceptions of uncomplicated UTI symptom severity: understanding the communication gap. Int J Clin Prac 61((2)):303–308. (2006) Overcoming barriers: the role of providers in improving patient adherence to antihypertensive medications. Curr Opin Cardiol 21((4)):310–315, pmid:16755199. (1989) Assessing the effects of physician-patient interactions on the outcomes of chronic disease. Med Care 27((3 Suppl)):S110–S127, pmid:2646486. (1985) Expanding patient involvement in care. Effects on patient outcomes. Ann Intern Med 102((4)):520–528, pmid:3977198. (2003) The association between satisfaction with services provided in primary care and outcomes in Type 2 diabetes mellitus. Diabetes Med 20((6)):486–490. (2001) Should parents assess the interpersonal skills of doctors who treat their children? A literature review. J Paediatr Child Health 37((6)):531–538, pmid:11903829. (2007) Chinese HIV-positive patients and their healthcare providers: contrasting Confucian versus Western notions of secrecy and support. ANS Adv Nurse Sci 30((4)):329–342. (1988) Patients' participation in medical care: effects on blood sugar control and quality of life in diabetes. J Gen Intern Med 3((5)):448–457, pmid:3049968. (2002) Physician gender effects in medical communication: a meta-analytic review. JAMA 288((6)):756–764, pmid:12169083. (2002) Key communication skills and how to acquire them. BMJ 325((7366)):697–700, pmid:12351365. (2001) Observational study of effect of patient centredness and positive approach on outcomes of general practice consultations. BMJ 323((7318)):908–911, pmid:11668137. (1999) Effect of clinician communication skills training on patient satisfaction: a randomized, controlled trial. Ann Intern Med 131((11)):822–829, pmid:10610626. (2004) Personality differences between doctors and their patients: implications for the teaching of communication skills. Med Educ 38((2)):177–186, pmid:14871388. (1988) Meta-analysis of correlates of provider behavior in medical encounters. Med Care 26((7)):657–675, pmid:3292851. (2007) Communication with older breast cancer patients. Breast J 13((4)):406–409, pmid:17593046. (1998) The role of the physician in the emerging health care environment. West J Med 168((5)):328–333, pmid:9614789. (2000) Collusion in doctor-patient communication about imminent death: an ethnographic study. BMJ 321((7273)):1376–1381, pmid:11099281. (1995) Rethinking medicine: improving health outcomes with cost-effective psychosocial interventions. Psychosom Med 57((3)):234–244, pmid:7652124. (2003) Moving from information transfer to information exchange in health and health care. Soc Sci Med 56((3)):449–464, pmid:12570966. (2008) ALS patients and caregivers communication preferences and information seeking behaviour. Eur J Neurol 15((1)):55–60, pmid:18005051, Epub 2007 Nov 14. doi:10.1111/j.1468-1331.2008.02143.x. (2007) The contributing role of health-care communication to health disparities for minority patients with asthma. Chest 132((5 Suppl)):802S–809S, pmid:17998344. (2007) A systematic review of prognostic/end-of-life communication with adults in the advanced stages of life-limiting illness: patient/caregiver preferences for the content, style, and timing of information. J Pain Symptom Manage 3((1)):81–93, pmid:17531434. (2004) Improving anaesthetists' communication skills. Anaesthesia 59((2)):166–172, pmid:14725519. (1985) Evaluation of an interview training course for general practitioners. Soc Sci Med 20((7)):737–744, pmid:4012361. (2007) Collaborative communication in pediatric palliative care: a foundation for problem-solving and decision-making. Pediatr Clin North Am 54((5)):583–607, pmid:17933613. (2007) Does copying clinical or sharing correspondence to patients result in better care? Int J Clin Prac 61((8)):1390–1395. (2006) Doctor and patient perceptions of the level of doctor explanation and quality of patient-doctor communication. Scand J Caring Sci 20((2)):143–150, pmid:16756519. (1983) Behavioral consequences of consumer dissatisfaction with medical care. Eval Program Plann 6((3–4)):291–297, pmid:10267257. (1998) Clinical interview skills and identification of emotional disordes in primary care. Am J Psychiatry 155((4)):530–535, pmid:9546000. (2004) Patient-physician communication. Curr Opin Rheumatol 16((2)):91–95, pmid:14770091. (2004) Women's perceptions of decision-making about hysterectomy. BJOG 111((2)):133–142, pmid:14723750.